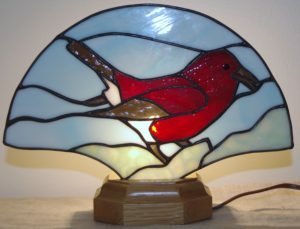 A revival of an old favorite of the Victorian parlor, a stained glass Fan Lamp is a wonderful piece of functional art you can use in your everyday life, great for use as a night light. In this workshop, you will create your own panel fan lamp. “Stained Glass Basics II: Fan Lamps,” taught by Claudia McCall, will be offered on January 12, 13, 19 & 20, 2019: Saturday and Sunday from 9am – 12pm. Claudia will provide several patterns from which to choose, though students are welcome to bring their own ideas. You will complete this 4-session workshop with a finished fan lamp, and the knowledge and experience of the basic skills involved to continue working with stained glass. During this workshop, students may opt to create a light catcher instead of a fan lamp. Class fee is $100/$90 VAC members plus a $30 supply fee. An additional $20 supply fee for the lamp base and bulb will be charged for students who wish to create the fan lamp. Anyone with prior copper foil stained glass experience is welcome to enroll.